Eminent journalist and Chairman of the Hindu Publishing Group, N. Ram, receives the Raja Ram Mohan Roy Life Time Achievement award from Union Finance Minister Arun Jaitley as Press Council of India Chairman Justice Chandramauli Kumar Prasad look on in New Delhi on November 16, 2018. Technology has ensured that a 1975-kind of Emergency that put fetters on free speech and media is no longer possible, Union Finance Minister Arun Jaitley said on the occasion of National Press Day. “If Emergency was ever to be reimposed, it would collapse for the simple reason that one of the strengths of the Emergency was press censorship and technology does not permit a press censorship today,” he said. 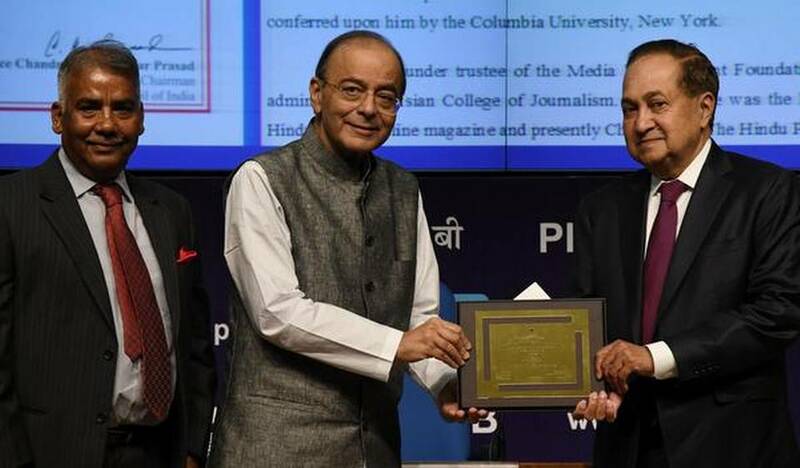 N. Ram, Chairman, THG Publishing Private Limited, The Hindu Group’s publishing company, was awarded the Raja Ram Mohan Roy Award by Mr. Jaitley for his lifetime contribution to journalism. Speaking on the occasion, Press Council of India chairman, Justice C.K. Prasad batted for revisiting the law to give more teeth to the Council, the print media watchdog. On digital media, Justice Prasad said it was a chaotic landscape evolving at a furious pace that throws up severe ethical challenges. “The values of traditional media accuracy, pre-publication verification, balance and impartiality are seldom seen in this form of media,” he said. The other awardees include Ruby Sarkar, chief correspondent, Deshbandhu newspaper from Bhopal; and Rajesh Parshuram Joshte of Daily Pudhari, Ratnagiri, who won the award in the category of Rural Journalism. V.S. Rajesh, Deputy Editor, Kerala Kaumudi, was selected for ‘Developmental Reporting’. Subash Paul of Rashtriya Sahara was given ‘Photo Journalism-single news picture’ award. ‘Photo Journalism-Photo Feature award’ went to Mihir Singh of Punjab Kesari. P. Narasimha of Nava Telangana won the award for Best Newspaper Art.